Disappointed with the cloth diapers I used for my oldest daughter, and feeling guilty for all the waste I created using disposable diapers, I went on a quest for the perfect diapering system. One of the first things I noticed about Heather's shop were all the cute prints. Her cloth diaper covers are sized, and Charis weighs 27.5 lbs. [towards the end weight for the mediums, but beginning weight for the large covers]. Thankfully, I decided on getting a large cover for her. When I first received the diaper, my first thought was, "This looks small." But, I was surprised and quickly saw it works very nicely with a prefold or flat diaper folded up into a pad [I wish I had this diaper during the flats and handwashing challenge]. The cover also fit over Charis's Thirsties duo fab fitted diaper. I prefer aplix closures on diapers because it helps me to get a better fit on my daughter and it's a little bit easier, and this is no different. I also like that Heather's covers are sized because it is truer to Charis's size. 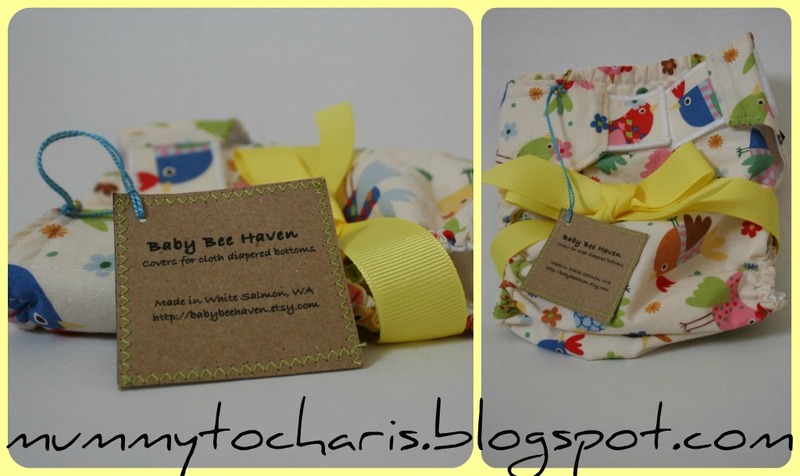 I recommend Baby Bee Haven and will keep these covers in mind if I need to buy more covers. You can buy a cover for yourself at Baby Bee Haven or you can enter to win one for a Merry Fluffy Christmas which runs from December 1-5. Baby Bee Haven sent me a cover to review. I so miss cloth diapers - it was a wonderful hobby. Alas, potty training is complete so no excuse. But I still occasionally enjoy reading about them. I am excited you are participating in Merry Fluffy Christmas.